Wildflower Roof Turf has been developed by the company using its unique ‘soil-less’ system that is more drought tolerant than the landscape product. It is easy to handle and delivers a guaranteed wildflower environment on a roof. 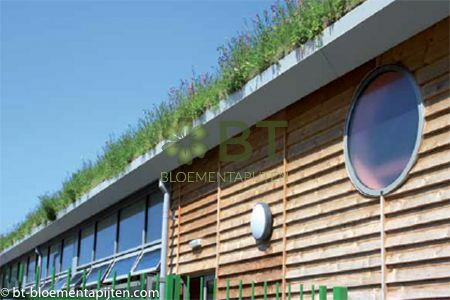 The roof turf is made up of 38 UK native wildflowers and grasses, with a minimum of 75% wildflowers. This product can be used in conjunction with our unique Wildflower Roof Substrate. This substrate has been developed to support plant growth whilst free-draining and is lightweight. To produce this environmentally beneficial product, every effort is made to source sustainable ingredients, for example composted green waste and organic nutrients, as well as carefully monitoring all inputs such as electricity and water. The turf naturally produces a bio-diverse habitat supporting birds, mammals, bees, butterflies and other invertebrate species. Developed to minimise irrigation and to thrive in this particular environment. Shade tolerant. Cutting Cycle: Once every autumn Watering: For the first 2 weeks to prevent turf from drying out. After which just the odd soak in long periods of dry weather. Consider irrigation.